Weinberg freshman Clayton Reynolds recalls his experiences in rural Nebraska during a Mayfest event Sunday evening. Four other students also shared stories at The THREAD, one of several events Mayfest has organized in the lead-up to Dillo Day. Five students crossed items off their Northwestern bucket lists during a Mayfest event Sunday night. 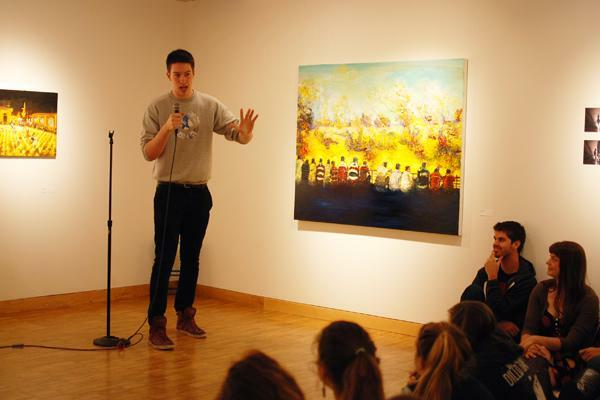 The annual storytelling showcase, known as “The THREAD,” brought about 40 people to the Dittmar Memorial Gallery at Norris University Center. “Like all great stories, this one takes place in rural Nebraska,” opening speaker Clayton Reynolds said. The Weinberg freshman told a story about how a high school party gone wrong led him to meet President Barack Obama. The event, now in its third year, is based off of The Moth, a nonprofit organization based in New York City that puts on performances dedicated to the art of storytelling. “The idea was to have Northwestern students share their stories with other students,” said Rachel Schwab, a member of the Mayfest special events committee and Weinberg sophomore. Each storyteller shared an event from his or her time as a student at NU, ranging from a fantastical adventure to discover what was locked in the tower of Garrett Seminary to a tongue-in-cheek account of not participating in Dance Marathon. Like stand-up comics, each performer elicited laughs from the audience, many of whom lounged on blankets and pillows in front of the speakers. Susie Neilson said before she got to NU, she was not the kind of person to make a bucket list. The Medill sophomore told how her newly found “YOLO” outlook on life led her to organize a polar plunge this winter. Eytan Boclin, a Medill freshman, shared how he crossed “not doing Dance Marathon” off of his NU bucket list. “There’s no feeling like going against what literally everyone on campus is going to do,” Boclin said. Mayfest co-director of promotions Bri Hightower said planning the event mainly involved recruiting good storytellers to apply. Following the plan of years past, the event centered on the theme of NU bucket lists. Mayfest members collected bucket list items from the audience, which they read out loud between storytellers. Ben Kemper, a self-described “inveterate explorer,” told how stories of a briefcase filled with $6 million hidden on campus led him to discover the secret of what is kept in the Garret Seminary tower. Anticlimactically, it turned out to be art supplies. The Communication sophomore said he hopes that everyone can one day find a story that will evoke as much joy and hope as the fictitious briefcase did for him. Kelleigh Whelan, a Weinberg junior, told stories of her experiences studying abroad. “Not only did I cross off my bucket list eating German chocolate and learning how to say cheers in 10 different languages, I also got myself a European boyfriend,” she said. The event, which has been held throughout Evanston in places such as Harris Hall and J.J. Java, aims to highlight the unique talents of NU students.